Dan appeared on Good Morning America Friday, January 31st, to discuss the latest verdict for Amanda Knox. 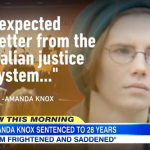 Italian courts have convicted Knox once again for the 2007 murder of Meredith Kercher. The question now, will Italy request to extradite Knox? Says Dan, “Extraditions from the US to Italy are very rare, more common is the other way around. Still between 2003 – 2012 less than 50 people were extradited to the US from Italy. Now under this US- Italy extradition treaty, an offense is extraditable if it’s punishable under the laws of both countries. Knox will argue since she was acquitted once under U. S. Law that would be double jeopardy and therefore not covered. The problem, others from different countries have tried that argument and failed. But with the American public support behind Amanda Knox, this case is likely to be different since in the end, it’s a political decision to be made by the state department.” Watch the full clip here.